The Graduate and Life Sciences Education (GLSE) team is committed to organizing events that will help undergraduate students discern their future career paths. The program aims to give undergraduate students in the Life Sciences an opportunity to appreciate the innovative research conducted in the Faculty of Medicine at the University of Toronto. In addition, we hope to encourage students to consider graduate studies in the Faculty of Medicine following their undergraduate studies. With this end in mind, we will be pairing undergraduate students with 4th year undergraduate/graduate students from across the 14 different graduate programs offered in the Faculty of Medicine. Undergraduate and graduate mentors will give an overview of the nature of their research and how it may tie with concepts undergraduate students have learned in their lectures. Additionally, students will have an opportunity to shadow 4th year undergraduate/graduate students as they perform their experiments and daily tasks. All Life Science undergraduate students are encouraged to participate, regardless of year of study or program major. There is no requirement for previous research or laboratory experience. In fact, the program aims to give students a glimpse into the research environment and to answer questions they may have about the graduate student experience. 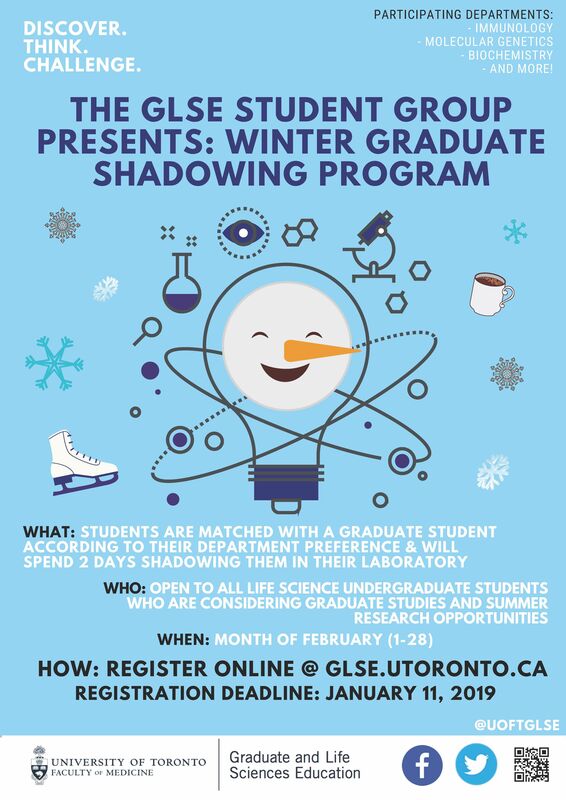 Students interested in participating for the event will be asked to register at glse.utoronto.ca. Upon registration, students will be prompted to list their preferred graduate program which will subsequently guide the pairing process conducted by the GLSE team. Note: Due to the exceeding number of applicants, we encourage students to apply early to secure their desired field. Moreover, we will be pairing students on a first-come, first-served basis.